The type 83 Solid State Tube replacement module is designed for Hickok and B&K testers that have a need for type 83 tubes. The original type 83 tube was filled with mercury to regulate a voltage drop of about 15V when new. True NOS 83 tubes are becoming rare and expensive. 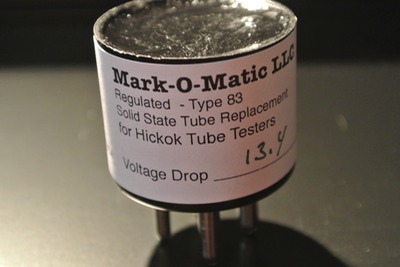 This Solid State replacement mimics the regulated voltage drop of the original type 83 tubes. Many values are possible, but a voltage drop of 13.4V works best for most Hickok testers as the slightly lower voltage will not adversely affect tester readings while providing some workload relief to the older transformers. A voltage drop of 11.2V or 12.2V also works well for very old testers that are exhibiting some signs of transformer issues, or in cases where Line adjustment cannot be set with adjustment at maximum due to transformer age. These units are different from run-of-the-mill SS replacements that have an unregulated voltage drop of about 1V.